For the love of bunnies, zombies and frocks! : Beats by Zomboy! Hey there BZF party people! It is a known fact that my most favourite way to drive to work is with some skull shattering bass heavy tunes playing as my little Mitsubishi pumps out the best volume it can. I know I’m not alone when I say that some days are just harder to kick start than others. If you too suffer from this affliction, sometimes referred to as ‘Monday-itis’ or ‘Die Monday Die’, I am happy to share with you somebody who has become a bit of a saviour in such situations. 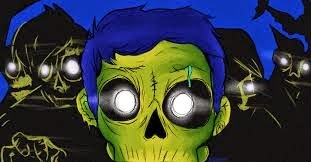 Presenting Zomboy – that’s right boys and girls, we thought the undead were only useful for feasting on our fleshy physiques, but as it turns out, the next name in Electronic Dance Music is quite audibly apocalyptic. Whilst doing my usual Youtube binge-fest, I came across a track called Survivors, now if you’re not familiar with dub-step or other forms of EDM then it’s the kind of music that your parents would describe as a broken machine, stuck on repeat and possessed by the artist formerly auto-tuned as Cher. Having to know more about this boy zombie DJ, I continued to slurp up more of his tunes and quickly became his number one fan (stalker) on Twitter. I like the fact that Zomboy has infected his music with sirens, chaotic synths and hectic beats which really adds to the doomsday delirium that you experience when listening to his playlist. A stand out for me is the track Nuclear, which does an excellent job of creating a dark atmosphere by adding some authentic sound grabs and emergency public announcements. Well I feel like I have done enough talking and feel it is time that you experience the deadly rhythms of Zomboy!! !